Order within hours minutes – SHIPS Today! All posters we print are full-color, printed on 200-year archival quality paper stock. We print your posters same-day at no extra charge. 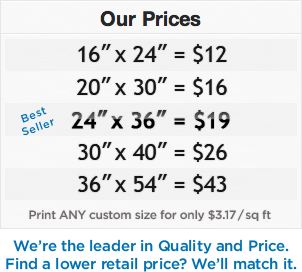 We offer standard sizes of large format poster prints including: 16″ x 24″, 24″ x 36″, 36″ x 54″. We can also print in custom sizes from 16″ to 150″ depending on the dimensions of your image. Because we offer high quality paper and printing as well lamination and fast turnaround times our posters are great for retail signage, menus, or presentations. In fact, our printing process is perfect for businesses needing to print 1 – 50 posters.